Nice post Somu. 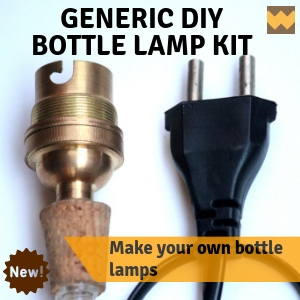 Yes one of the best benefits of DIY is being able to fix things at home when really needed. Hi Vinay, thanks... Am sure you would appreciate it because I guess you would have been involved in quite a bit of home repair yourself. Sometimes we do it because it is difficult to get the right guy on time and sometimes we do it for the sheer fun of it. Either way, as you mentioned, it comes in handy at a time when it is needed the most. 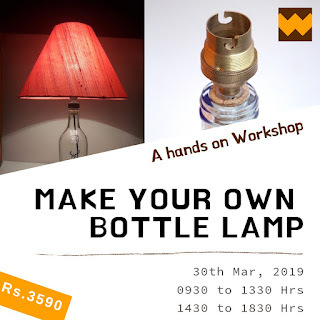 Indeed, making things from the ground up might be the more satisfying act creatively since you can control all aspects of developing the thing, at the same time, it is the repair/make-it-work-again/jugaad activities which are the things that a DIY'er can expect to encounter more often. It definitely makes financial sense to try and repair something. Also, the approach of a normal handyman in India is to correct something just enough to make it work without any thoughts on quality or appearance or longevity. Simple examples like putting only 3 screws around the electrical switch board. or putting dirty hands on the wall while taking the bulb out are commonly available. When you DIY, you do it to your satisfaction rather then finish-and-scoot approach they follow. You are absolutely right MS... Infact workarounds are what is provided at times. Some of the fixes are either to solve the problem for the moment or provide a permanent fix at an exorbitant price. Both never works our in our favor. True that sometimes DIYing may not really yield the results we want on a long term basis and professional help may be needed. 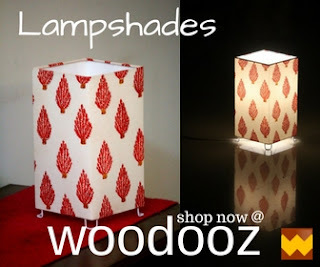 But there is so much fun in trying before we go to experts.. DIY truly results in a feel good factor irrespective of the look and feel of your work. 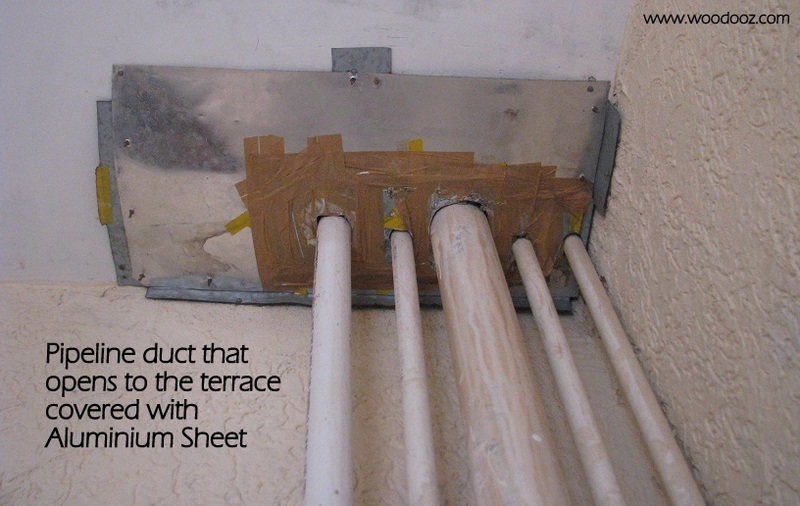 In the examples I have cited above, the idea was to leave behind the problem and since the drain pipe and the pipe duct were not in visible areas, I was happy to leave it the way it looks now :) But I doubt if I would do anything of that sort anywhere else. I have had a similar issue in my sisters recently built house. First off this is not a proper way to drain a sink. Im sure there are building codes which list how a sink needs to be drained. Look up in the Muncipal codes(yes they exist even in India). Every drain that is linked to the house should have a P-trap and a vent(every area is sufficient like one for bath room and one for kitchen, a shower area and toilet pot requires their own separate vent). This is to prevent sewer gases from coming into the home. The P-trap which is a U shaped section of pipe which contains water at all times. This column of water prevents sewer gases from coming into the house. The vent near/ on the same sewage line provides a way for sewer gases to be vented out before the put too much pressure on the water column in the P-trap. 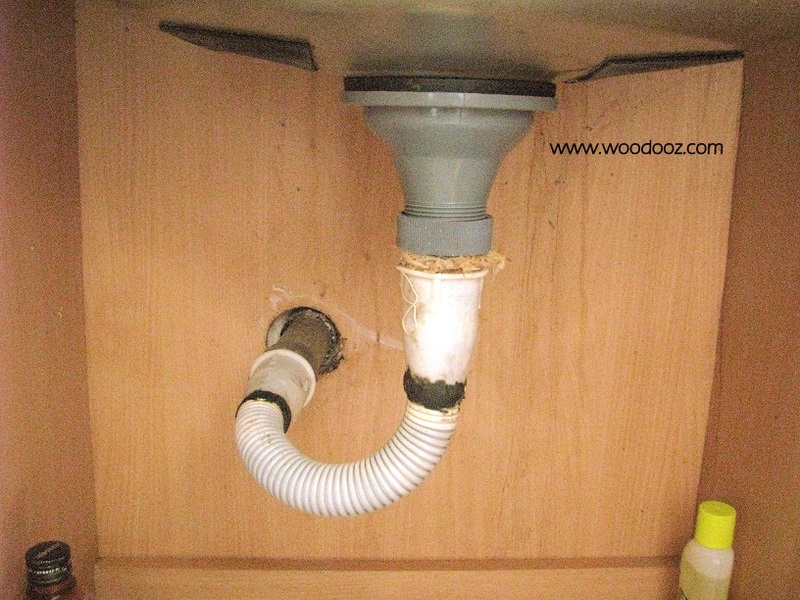 Apart from that the corrugated pipe is not advisable for any sink as the corrugations trap debris which will be rotting in there and eventually cause blockage. Thus the 6 month replacement being bandied about. 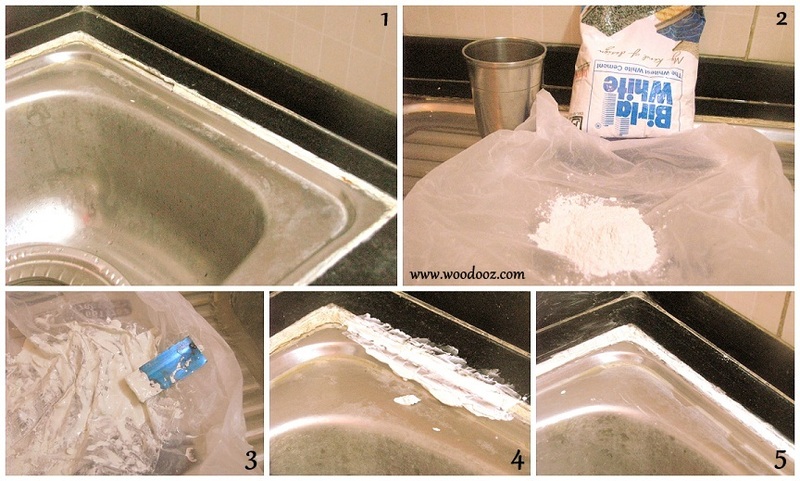 Use silicone grout in the kitchen which is water proof. It is available in India in a tube. I dont know the brands now a days but GE was popular about a decade back. You must inspect grouting every six months and replace every year. All the same a good job with the knowledge available to you. Hi Kittu, Just read about P-Trap after seeing your comment. That is really a very useful information that you have provided. I have seen P-Traps (Though did not know what it was called) in many installation and did not even know why it was there. I will relook at the whole thing and see if I can make any alterations to install it the proper way. You are also right about the corrugated pipe. Though it is only a small section that I have used, it does accumulate debris. Sometimes no job is good job when only done with limited knowledge. Your comment is an eye opener. 2) can be used to trap solid particles which eventually clog the drain pipe. the "bottle" can be opened for manually removing the muck. by looking at your installation, you might need a bit of PVC pipe to extend the terminating end of the "bottle trap". Very useful post. I have a problem with my kitchen sink too and have been planning to do something about it. Problem is to find the precise diameter of the outlet pipe. In India they sell "standard" sizes which invariably do not fit. Kittu is right about corrugated pipes and luckily I read this because I have bought a piece of corrugated pipe just like yours and was planning to attach it. Will get CPVC pipes which are joined by a solvent. Very tough and reliable I am told. Indranil, you are right about the solvent. I have a PVC pipe that goes into the wall pipe and I used the solvent. Now I am not even able to pull it out. Quite reliable. As for the corrugated pipe, I am also now relooking at it. Let me know how your installation goes. Because of the mis-alignment am not able to use PVC / CPVC directly. Will explore more. I have a question , about veneer panelling for wardrobe. In our case, the edges of the panels seem to be chipping off. Online i see something called veneer edge banding. Do yu know if these are available in india? Yes, veneer edge banding is available in almost all local plywood stores... Especially those shops that sell veneer, mica or laminates. You will also have color options and you can choose one that closely matches your wardrobe laminate / veneer. Hope this helps. Let me know should you need more information. private label manufacturers This is exactly the information I'm looking for, I couldn't have asked for a simpler read with great tips like this... Thanks!